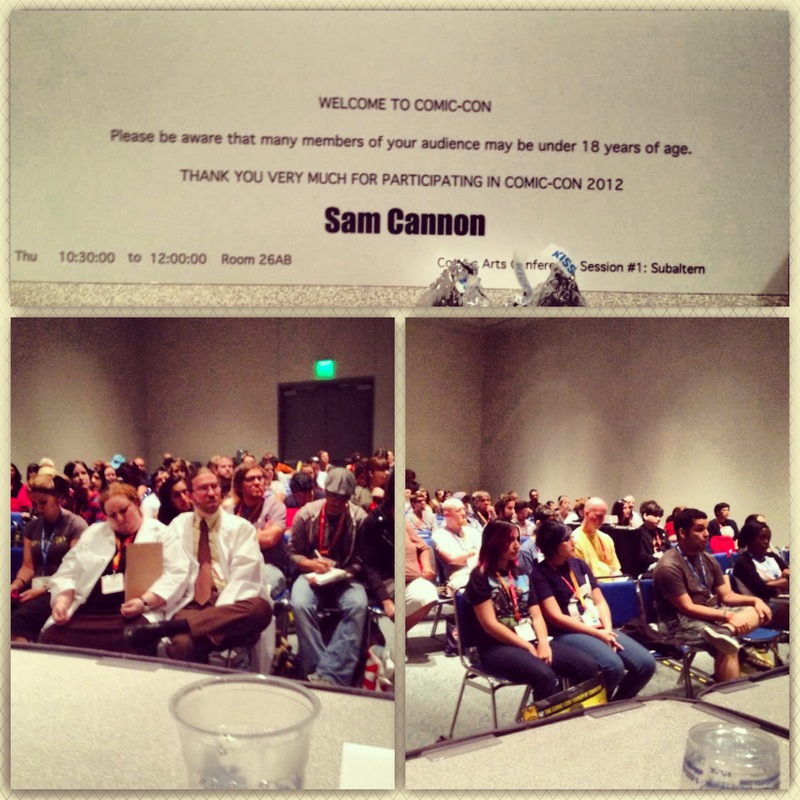 A few weeks ago I had the opportunity to attend San Diego Comic-Con and participate in the Comics Arts Conference. This academic conference that focuses specifically on the medium of sequential art runs the entire length of the Con and is well attended. The Comics Arts Conference was founded by Peter Coogan and Randy Duncan and brings together comic fans, creators, and scholars. Over the last three years I have attended the Comics Arts Conference and presented papers twice. I have participated on panels that deal with minorities, subaltern subjectivities, violence and memory. Being the only presenter that specifically researches Latin American comics and graphic novels I always attempt to make contacts with others doing similar research or find Latin American or Spanish language texts in the enormous exhibit hall. Interestingly enough over the last three years I have held more conversations in Portuguese than in Spanish. The year before last, I met a professional clown from Portugal with whom I had a conversation about the paper I was going to present about the Mexican comic book El Pantera and its indigenous protagonist. This year I was approached by Nikolai Fomich from bleedingcool.com before my panel started and discussed in Portuguese the topic of my presentation, Daytripper. Nikolai wrote an article for bleedingcool.com about the panel and has several insightful questions for me after my presentation. You can read his article here. These encounters highlight the importance that Portuguese and Brazil have in our field and I have found myself involved in more and more discussions in Portuguese and about the research I am doing on Brazil. Brás de Oliva Domingos is the graphic embodiment of 21st century Brazilian upper-middle class ambitions and success. At the age of 11 Brás has his first kiss and later is electrocuted to death, at 21 he travels to Bahía and meets a mysterious mulatta but later that evening he drowns. When he is 28 he meets the woman he will marry in a convenience store and then run over by a delivery truck in the street; at 38 Brás is a well-known literary author that travels the country promoting his book, but when he visits his best friend his throat is cut in a brutal murder/suicide. Finally, at the age of 76 he decides to refuse treatment for his brain tumors and faces his death. The only problem with Brás’ story of Brazilian upper-middle class success is that he is repeatedly dying. He is haunted by death. At the end of each chapter of Fábio Moon and Gabriel Bá’s graphic novel Daytripper the protagonist dies and yet continues to live on the following page as if nothing had happened. In Craig Thompson’s introduction to Daytripper he says that Brazil is “The country of the future” and then compares Moon and Bá to the “thriving, vibrant” nature of Brazil. Indeed, Daytripper is about progress towards the future, but I propose that this progress is put into question through the graphic novel’s deadly configuration and that analyzing Daytripper’s narrative structure will produce a type of deathscape for the traditional Brazilian upper-middle class. Daytripper can be seen as a new form of the Brazilian comic that takes up the challenge of representing the outcomes of Brazil’s project of modernization embodied by the Brazilian upper-middle class. Both the development of the comic and the process of modernization have their roots in the 19th century, and in the 21st century an analysis of the fruits of the processes of modernization through the medium of the comic provides insight into the results of Brazil’s constant impulse towards “Ordem e Progresso.” Moon and Bá’s graphic novel shows the life of their protagonist, Brás de Oliva Domingos, and how he successfully reaches contemporary bourgeois social and economic goals. If it weren’t for the fragmentation of the narrative of Brá’s life the text could be read as a naïve reproduction of globalized and neo-liberal economic ideas of success that does little to problematize the protagonist’s idealized life. Brás, as a character, can be seen as an example of the national imaginary of the upper-middle class: white, successful, educated and rich. In this way, Brás de Oliva Domingos functions as a character that registers neo-liberal ideas of success within the Brazilian imaginary. The narrative of Brás’ upper-middle class life will be the focus of this analysis. There is an important structural distinction to be made between the story (the fabula) that is told in Daytripper and how that story is told (in formal terms the syuzhet). First there is what happens in the text or the storyline. In this case Brás’ life is shown at particular points starting when he is 11 and ending when he is 76. It is also important to consider how this story is told. In this text the story is told out of order and, most interestingly, punctuated by the death of the protagonist at the end of each chapter. In Daytripper, Brás’ fragmented life is told in the following order: 32, 21, 28, 41, 11, 33, 38, 47, 76. This deployment of the storyline makes Brás’ life difficult to understand since consequences, expectations and the current chapter’s relationship to past events are frustrated and inaccessible. If Brás is seen as representative of Brazilian upper-middle class success and progress then the ability to understand his progress and success are also hindered. This uncertain path to achieving success in modern Brazil echoes José de Souza Martins’ description of modernity as “the permanence of the transitory and the uncertain, in the face of linear and supposedly infinite progress” (249). The structure of Daytripper emphasizes the uncertainty within the allegedly clear path of Brazilian progress. Although this unconventional method of narration is interesting it is only part of why the graphic novel’s structure is so important when analyzing this text. What is truly unique about Daytripper’s representation of Brás’ successful life is his death at the end of each chapter. The graphic novel is made up of ten chapters and nine different deaths, yet none of these deaths have an impact on the diegetic life of the protagonist. If they do not have any consequences in the story itself then why are they included and what meanings can they hold? The sequences of images found in the sequential art of Daytripper can be read, like Benjamin suggests, as the flashing life that passes before the eyes of a dying man: Brás de Oliva Domingos, the embodiment of the Brazilian upper-middle class. As the events in Daytripper appear in an uncertain and precarious order they are given importance through the death of the protagonist. If Brás is read as the imaginary of Brazilian bourgeoisie success then Brazil looks back on itself, it encounters itself, as it is shown dying over and over and yet unable to rest in that death. It is in this death that Brás can achieve authority to reveal the ruptures and uncertainties of the outcomes of Brazilian projects of modernization. It is also here that the absence of the rest of Brazil’s social classes can be glimpsed. Brás, notwithstanding his privileged socio-economic position, is as vulnerable to death as the “poorest wretch” or even more vulnerable as he dies repeatedly. This action of Brazil looking back at itself through Brás’ deaths opens the question of how Brás and his deaths fit within the nation and how they can be read in this context. In the first chapter of the graphic novel it is revealed that Brás is an obituary writer. His writing takes on a national importance as he is assigned to write the obituaries of the passengers of TAM Airlines Flight 3054 that crashed in São Paulo in 2007. These obituaries of national significance launch Brás’ writing career and put the cost of his own success into question. While there are many obituaries found in Daytripper, the most unique obituary that appears in the graphic novel is located in the only chapter of the book where Brás does not die. Chapter 9 is a dream and unites the segments of Brás’ life that are narrated in the other chapters. In the dream Brás is shown writing his own obituary. His obituary is about the nature of dreams and he writes, “All the places my dreams take me, no matter if I’ve never been there or never will be help me understand where I come from and where I want to go” (223). In this dream chapter all of Brás’ ambitions and goals are present. His progress as a writer, his economic success, his family and his accomplishments are laid out and can be read as a roadmap to 21st century Brazilian social mobility. This obituary to himself emphasizes that ambition or dreams “tell me who I am” (223) and in this sense Brás again appears as a model of a certain type of neo-liberal ideology. His self-written obituary reproduces the concept that the individual is defined by their ambitions and singularly responsible for their own fate. Brás, as a model upper-middle class citizen, shows that these neo-liberal dreams are attainable, and currently in Brazil they are becoming more accessible than ever. But while the middle-class expands and ambition or dreams lead the way, the threat of a violent death is ever present and maybe even inevitable. Returning to Martins’ assessment of modernity it can be seen here that it “announces the possible, but fails to realize it” (249). The confirmation of success and ambition as guiding principles in modernity appear only in this illusive dream world and is harder to obtain in waking life. This dream obituary can be seen as a personal obituary written by the traditionally small middle-class to itself. In this sense Brás is leaving behind instructions for those newcomers to his socio-economic position: dreams and ambitions will define you in neo-liberal Brazilian modernity, but at what cost and what type of strange paths must be taken to arrive there (if they lead there at all)? Daytripper does not just contain Brás’ self-written obituary, but is full of obituaries that mourn the lives of other Brazilians that all occupy the same socio-economic sphere as the protagonist. Are there only successful white people to be mourned in Brazil? Throughout the graphic novel Brás writes obituaries that are included in the text and are contained within specifically colored and styled word balloons. The obituaries thus become visually distinct from other texts in the comic. These obituary word balloons have torn edges, as if they were yanked from a newspaper, and may poetically expresses the rupture from life that is death. These distinct, torn obituary texts take on added meaning when considered as a special type of comic narration that Thierry Groensteen has labeled “general arthrology.” According to Groensteen’s theory a comic text can be read as a whole and seen as having “translinear or distant” connections that “represent a more elaborated level of integration between the narrative flux […] and the spatio-topical operation” (22). Thus, it is possible to read the obituary word balloons as having their own function within the entirety of the graphic novel that can surpass the linear and sequential reading of the narrative. In this, reading the text, the narrative expressed through the obituary word balloons, initiates the graphic novel in the first panel and closes the novel at the end of the dream chapter. This obituary text that exists outside of but also within the graphic novel (what Groensteen defines as structural “braiding”) tells a story of Brazilians that have lived and are leaving behind them some way of making sense or meaning of life. As Walter Benjamin pointed out “the ‘meaning’ of […] life is revealed only in […] death” (100-101). The deaths that give meaning to life in Daytripper are those of famous painters, politicians, soccer stars or couples travelling to Paris, etc. The midde-class lives and dies and creates meaning while the lower echelons of Brazil’s socio-economic structure are absent, they do not live, nor die, nor create meaning. The network of obituary texts written within Daytripper mourns a class that was supposed to be the future and serve as a warning that dreams and ambitions do not always lead where they are supposed to take a person, or a social class, or a nation. As Brazil expands its middle-class through new and innovative programs it appears that Daytripper’s chapter 9 dream of success is achievable, but the graphic novel shows that in waking life there is death and vulnerability at the end of every small success, whether it be Brás’ first kiss or the publication of his first novel. Brás’ stories, and those of the obituaries throughout the book, are exclusively upper-middle class yet through the multiplicity of deaths they look back at themselves to reveal the absences. The deaths make them part of every individual’s experience – this reflexive exercise shows a “collectivity of victims,” those given meaning in the obituaries, those mourned as they die and show the precarious situation of even the incoherent success of the bourgeoisie, and at the same time they find themselves, repeatedly, suffering the same fate as those outside of their traditionally protected group (Martins 249). Those who are absent, those who can only be seen in the reflection of death are “those included but in an excluding way” (249), those that are being embraced by the nation and progress only to find that an uncertain, non-linear and deadly path to success awaits them so that they can join the ranks of dead honored in Daytripper’s obituaries. Fábio Moon and Gabriel Bá’s graphic novel shows the unstable nature of modernity and progress through its unique narrative structure and serves as an obituary to a Brazilian traditional middle-class that mourns the death of the unachievable ideals of modernity and progress. Brás de Oliva Domingos, the graphic novel’s protagonist, embodies these middle-class dreams and ambitions and even uses them to define himself only to be confronted by his own death at every turn, and is left to write the obituaries of all those who paid with their lives for him to achieve his goals. As Brazil expands the middle-class, and more citizens can model their lives after characters like Brás, more and more individuals can join in the production of this obituary that can create meaning from the structurally confusing “progress” of modernity.